With intimate details and newly-uncovered evidence Adnan’s Story goes beyond what the hit podcast Serial covered in its investigation of Adnan Syed’s case. On February 28, 2000, Adnan Syed was convicted and sentenced to life plus thirty years for the murder of his ex-girlfriend Hae Min Lee, a high school senior in Baltimore, Maryland. Adnan has always maintained his innocence. Rabia Chaudry, a family friend, believes he was wrongly convicted and has fought for his release. But by 2013, after appeals were exhausted, things looked bleak. Rabia contacted Sarah Koenig, a journalist and producer at This American Life, hoping that she would bring possibly shed new light on the case. Koenig’s investigation turned into Serial, the international phenomenon and Peabody Award-winning podcast. 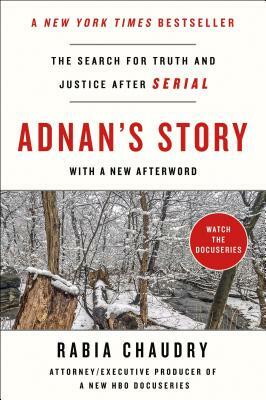 Adnan’s Story reexamines the investigation that led to Adnan’s arrest, covers new evidence and possibilities that have since come to light, reviews the court successes that have breathed new life to Adnan’s case, and in this new edition, reveals how she achieved success in the courts when Adnan was granted a retrial in March 2018. Woven with personal reflections from Adnan himself, including new never-before-seen letters he penned from prison, this in-depth book offers new insight into the story that captivated millions.